I just finished up three quilts at the same time (and boy are my arms tired!). 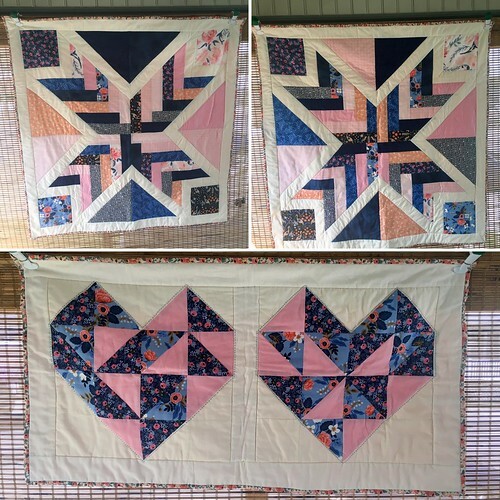 I made two quilts (each of them has a slightly different layout) from this pattern (the Starburst Quilt from Prairie Grass Patterns), plus a mini-quilt using part of a pattern from Quilt Petite (referral link). For the fabrics, I used a mixture of Les Fleurs from Rifle Paper Co and blues, peaches, and pinks from my stash. Working on three quilts at once can be slightly overwhelming, but it was nice to sit back and see the finished products all at once. We have some good friends who had a daughter when Lilian was only about 18 months old. I was still deep in the throes of new parenthood at that point, and I just wasn’t up to the task of making a baby quilt (I did throw the mom a baby shower, though!). They just had another daughter, so I decided to make quilts for both girls at once. I’ve never given a quilt directly to a three-year-old before, but it was very sweet! She got super excited about it, and immediately started running around with it draped over her shoulders like a cape. My friend texted me the next day that her daughter had been playing with it all morning. I don’t generally recommend procrastinating baby gifts for a solid three years, but it sure was nice to see something I made get so much immediate love. Here’s a PSA for parents: every now and then, pull out some of the stuff that you have stashed “for later.” Most small kids love love love things that were made especially for them. We are fortunate to have so many homemade blankets for Lilian that we have a quilt rack in her room that’s overflowing with them. She loves to pull them out and make little nests out of them, or choose one to sleep with. The other night, she got out of bed all on her own, and made herself sleeping area on the floor out of quilts. (I forgot to take a picture of the backs, but they’re all a pink flannel that has a slight orange-y tone to it). I am really loving hand quilting these days (I have another mini-quilt that I hand quilted and haven’t blogged yet). It looks so pretty, plus it’s something that I can work on downstairs while we’re all hanging out as a family. I am very fortunate to have a little crafting retreat up in the attic, but I can’t really work up there unless Lilian is either a) asleep or 2) doing something with Kristian. I sometimes bring her up there with me, but that just about always ends up with her making an unholy mess and me having to do a lot of reverse sewing on whatever I was working on. Sound proofing in a tucked away room: it’s a blessing and a curse. I’m currently working on another little mini-quilt for a friend, and then I have to decide what I want to work on next. I have a lot of fabric and patterns stashed away, I just need to take the time to make something with them!